FULL VERSION IS AVAILABLE FOR ONLY 0.99 BUCKS!!! 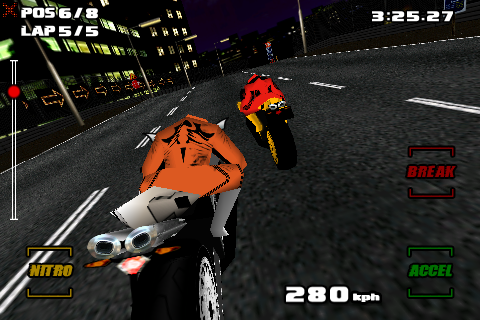 TIME TO EXPERIENCE THE MOST SPINE-TINGLING MOTOCYCLE GAME!!! *** BIKE STEERING HAS BEEN PERFECTLY IMPROVED!!! 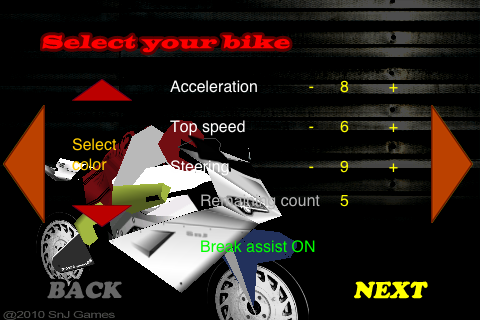 - Too hard steering was the weakness of the previous version, so we totally changed it!! Now, steering's got much easier,but weighty handling still remains. *** MAKE SURE TO CHECK VIDEO CLIP LINKED ON SNJ GAMES WEB SITE!!! 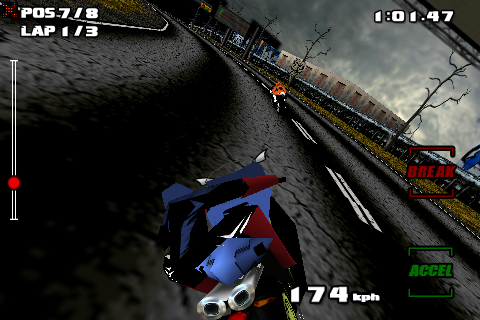 SnJ Games' Motobreath is now ready for you to show the most spine-tingling and exciting experience on your iPhone/iPod touch! 70 CHALLENGING TRACKS AND EVEN MORE (FULL VERSION)!! Play 5 different leagues with 70 challenging tracks. After playing though the whole level, 'Track generator' will be unlocked, which generates unlimited numbers of whole new random tracks. Sensible physic engine, riders' motion graphics and tuning of top speed, acceleration and steering will make you feel realistic and excited in same time. 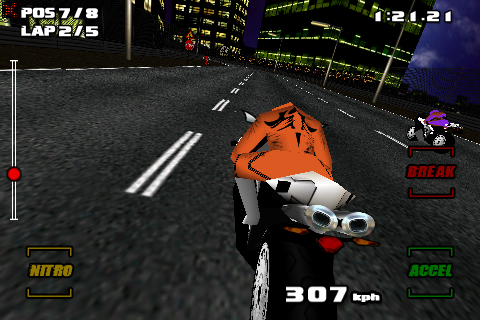 Works very fast and shows high frame rates even on iPod touch 1st generation, which means it provides the great sensation of speed than any other racing games. 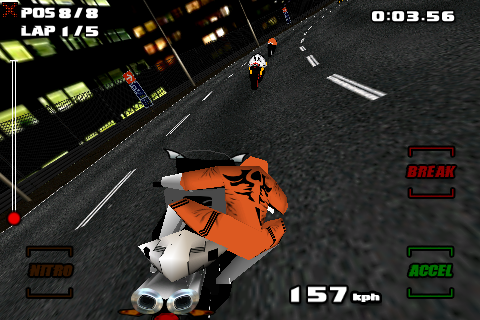 ENJOY THE MOST EXCITING MOTOCYCLE RACING GAME EVER PLAYED! Motobreath promises you to blow all your stress away! * You can watch video clip on the link below. SnJ games is widely open to your voice such as recommendations, suggestions or bug reporting.